Active Movement in Water is a National campaign in partnership with Sport and Recreation New Zealand (SPARC) supported by the Ministry of Health, Ministry of Education, Early Childhood Education Organisations, Plunket, The National Heart Foundation, New Zealand Recreation Association (NZRA), WaterSafe Auckland and New Zealand Swim Coaches and Teachers Association (NZSCTA) to raise awareness of the importance of a holistic approach to Early Childhood Aquatics. Extensive research in the area of brain development supports fundamental movement skills as paramount for brain development and critical in the early years. The water offers an environment where movement becomes free, balance is a stimulating challenge and the bonding between babies and young children and their parents is cemented. The importance of increasing awareness of the critical nature of fundamental movement and foundation aquatic skills, can not be overstated. The long term development of our children, maximising learning potential, and the opportunity for happy healthy lives in New Zealand starts with fundamental movement skills in the very young. The development of communication networks and resources linking parents/ caregivers and early childhood educators with Sports Trust staff, Swimming pools and Swim Schools will be paramount to the success of the early childhood aquatic development. To download resources for Early Childhood Centres, click here for Action Songs and here for Activities on a Shoestring. 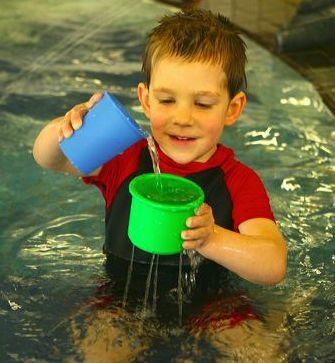 Active Movement in Water, uses water as a medium or environment in which to explore the fundamental principles and philosophies of Active Movement (a SPARC initiative launched in 2004). Active Movement in Water is an initiative with support and resources to encourage pregnant women, and parents of young children to be active, and encourage their young children to be physically active.